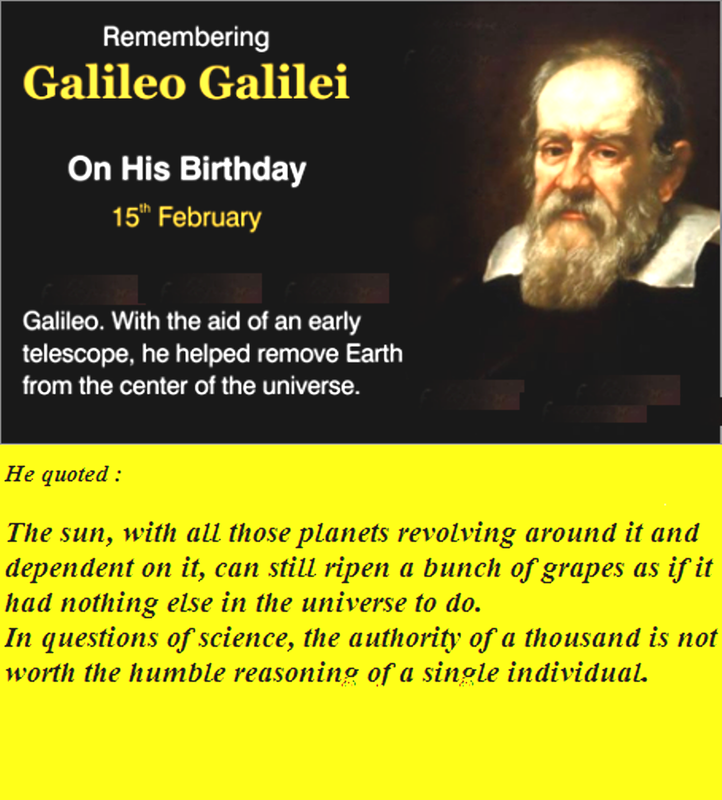 The Dove's Corner: #Remembering Galileo Galilei on his Birthday ! A tribute to a great scientist and thinker, who is credited to have developed the telescope and the physical proof supporting the crux of all physics that "Its not the earth which is at the centre of Universe , but the Sun is the center of the solar system, and the Earth and other planets revolve around it. As I share some of his invaluable quotes below, I am tempted to nudge a little , giving a thought to all amongst us who habitually always consider themselves to be the centre of their own Universe. Hence, while all trivia and miseries keep a strike on them, and they take it upon themselves to be the target of so much..., its also worthy for them and for us to be reminded to have our own telescopes in place ,to aid an inward tour ! The sun, with all those planets revolving around it and dependent on it, can still ripen a bunch of grapes as if it had nothing else in the universe to do. In questions of science, the authority of a thousand is not worth the humble reasoning of a single individual. You cannot teach a man anything; you can only help him find it within himself. All truths are easy to understand once they are discovered; the point is to discover them. I do not feel obliged to believe that the same God who has endowed us with sense, reason, and intellect has intended us to forgo their use.